No fewer than seven shops have been razed down by fire at the Ayobo Garage in Lagos State. However, the cause of the inferno is still unknown. Properties worth millions of Naira were allegedly lost to the fire. 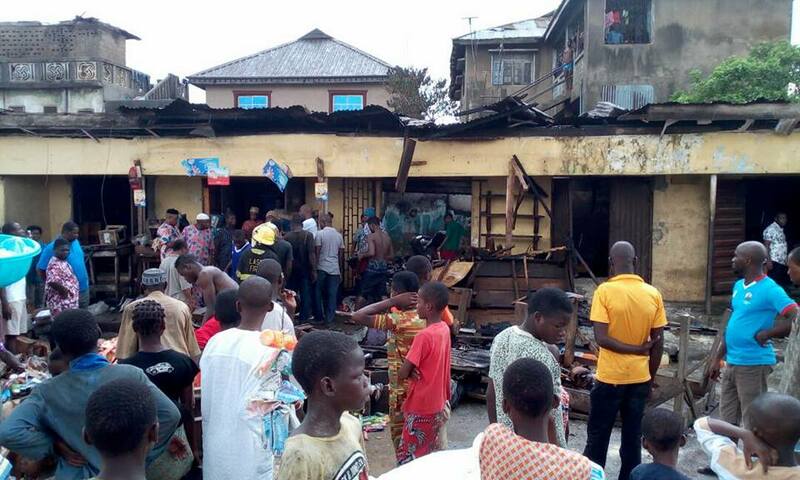 According to Agege Pulse, it took the combined efforts of some good Samaritans and officers of the Lagos State Fire Service to bring the situation under control and prevented it from spreading to other shops. Chairman of Agege local government, Mr Ganiyu Kola Egunjobi, who was alerted about the inferno by Ward C, Agege Councillor, Mr Hassan Ala, rushed to the scene. He was accompanied by Mr Bisi Adedoku and the Special Adviser on Special Duties to Executive Chairman, Mrs Ramot Sanni. On arrival, it was gathered that Mr Egunjobi appealed for peace and encourage the affected shop owners to remain calm. However, Mr Egunjobi fumed at the looting of some affected shops by hoodlums in the area, describing it as callous. According to report, the incident remains a mystery because the area has been without electricity for about six months.